Little House on the 100 Farm: A Giveaway! 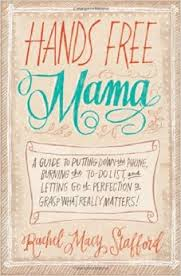 I have decided to giveaway a copy of the book, Hands Free Mama by Rachel Macy Stafford. I listened to this audiobook this past summer and I really enjoyed it. It decided to purchase a copy so I can give one away to my readers. I love to encourage moms, and anything I find that I think will help you out, I love to tell you about it. I, also, am a work in progress when it comes to balancing life and the demands that come with it. There are times when we just need to unplugged and walk away from our electronic devices and be fully present with our family. This book is going to help give you the conviction to do that. This giveaway starts on 10/28/15 and ends on 11/4/15. I would love to get this and give it to my daughter. I see her on her electronics instead of enjoying her precious little 2 year old. I know just how I could do this if I win a copy so I don't offend her. Electronics have taken over our simplest tasks. It's time to unplug and become aware of our surroundings once again. I would absolutely love to have this book!